45 Years to the Month. I first want to thank everyone who served in Vietnam. To all of you a big "Welcome Home". I have been doing this for a few years now and I owe a lot of thanks to many people. These guys took me under there wing and talked to me and answered my many questions, some going way beyond of what I was asking. To be born at the end of the Vietnam War and have never served in the military, not once have I felt like an "outsider" and I thank them for that. Walter Deeks "I know 545th"
Robert Blackstone " I know 359th" ...........BTW He won! Bud Whitehead and his truck "Eve of Destruction"
Now here I want to make a special note to a few people. These people have gone out of their way and have helped make the Museum Collection what it is today. George Mainieri...... George is a long time friend and fellow MV collector. He is my parts supplier and have purchased a few of my trucks from him and a lot of my militaria. Without his help, I would still be searching for parts. Tom Rice......A fellow member of the GMMVC, tom took me under his wing in 1996 and showed me the way of having a good time with MV's and Camping in style. Thanks buddy. Jack Horvath.......Jack was with the 64th trans as their XO. He has spend countless hours on the phone with me over the years answering my questions as a leader of a transportation unit. He sent me a bunch of stuff that he had, one being one of my cherrished items a cold weather military sleeping bag!! He also sent some stuff that he had in Vietnam. Thank you Jack. Roger Williams........I cant say enough about Roger. He is perfect to talk to, he drove deuces with the 541st(the unit my 3 deuces are numbered after). 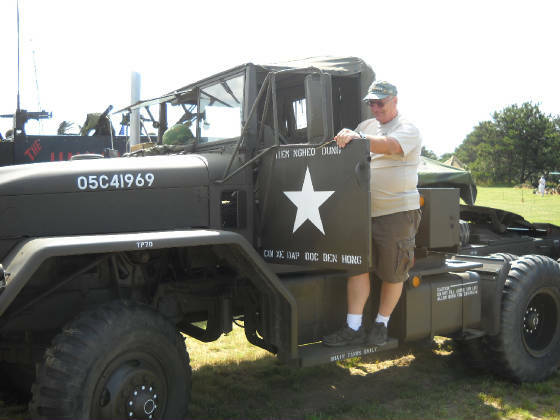 Then became a gunner on a gun truck. Then becoming NCOIC of a gun truck, and the whole time taking beautiful pictures!!! Pictures that he let me copy some of to use for a slide show presentation and the museum display. Thank you Roger. 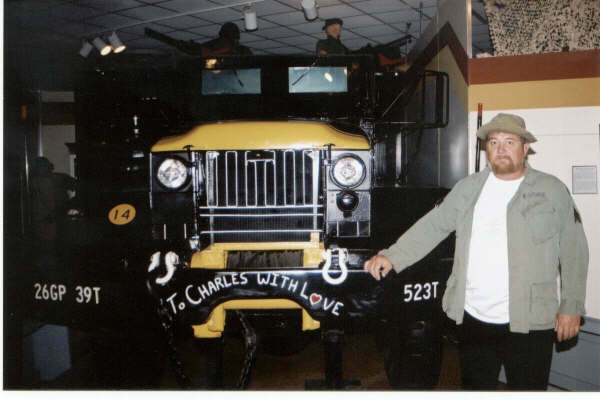 Phillip Sampley......... A driver of a deuce who was involved in one of the worst ambushes in Vietnam and a fellow collector of Transportation Memorabelia. He was one of the 1st that I started to talk to about trucking in Vietnam. He has also helped me find stuff for my collection and still does today. Thanks Phillip. The last one I want to thank is my good friend Rodney Getschman. Rodney was the 1st that I contacted way back in 1997. Before I had a computer, we chatted by phone and wrote letters. He was the "Chief", serving in 3 wars. 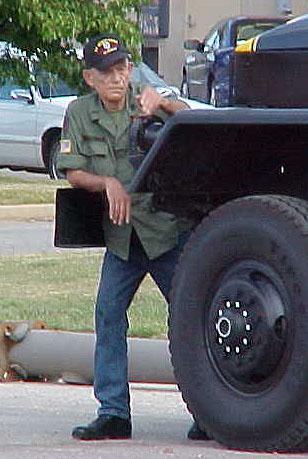 Joining the military in 1951 and retiring in 1991. Rodney had many years as a Maint. officer. He taught me what I know about setting up a efficient motor pool and OVM/BIL'ing the equipment and tools for the wrecker. In many conversations of trouble shooting maint problems on the trucks, chief was always right! I will never forget the "thats not bad kid, but try it this way" in our discussions. Rodney died quickly of cancer in 2005. I know he is still with us, I feel it every time I work on my trucks. When you own a fleet of antique military Vehicles, you need some friends with good connections and parts resources. Here is some of the sources that have helped keep the Line Haul Museum Rolling!! White Owl in Newton NC...........One of the Best!! John Tennis......Home of "Aces n Eights" GT. Cant say enough good things!! Here I wanted to add a special thanks to a special person. I want to thank my father Walter Houghton, for instilling a sense of history in me at a young age. I also need to thank my wife Bonnie. For putting up with me and my goals in life. Chasing me around in army trucks when they are running or not!